The shadows of the Sixth World have every kind of danger you can imagine: ultra-violent gangers, flesh-eating ghouls, mages that summon spirits from toxic waste, backstabbing corporate raiders, hard-nosed police officers, and even dragons. You don't have much — mainly your guts, your wits, and your friends — but maybe that's enough. Between you and your teammates, you can sling spells, hack the Matrix, talk a tiger out of his stripes, and bring down a charging ork from a hundred yards away. Will that be enough to face down the worst the mean streets can throw at you? You're about to find out. 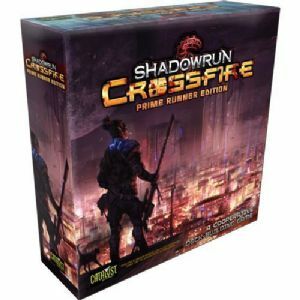 Shadowrun: Crossfire is a cooperative deck-building card game for one to four players set in the gritty, cyberpunk fantasy world of Shadowrun. 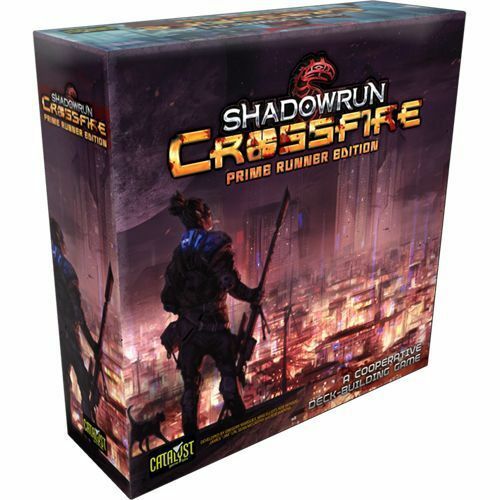 Play a shadowrunner team and take on tough jobs such as protecting a client who's marked for death, shooting your way out of downtown when a run goes sour, or facing down a dragon. In each game you'll improve your deck with a mix of strategies, while earning Karma to give your character cyber upgrades, physical augmentations, magical initiations, weapons training and Edge. ​​​​​​​Restock due Wednesday 13th February; The Prime Runner Refit Kit contains just the changed items, so that those who already own the game can buy only the items they need to get on the same footing as other players.